Make a Star Finder. Learn your way around the night sky by finding some of the constellations. Download and print the Star Finder for this month. Color or decorate the Star Finder, if you like. Then cut it out on the solid lines. Stick your thumbs and first two fingers into the four pockets on the bottom of the Star Finder. Ask another person to choose one of the top four squares. Then, depending on the number on the square she chose, open and close the Star Finder that many times (open up and down, close, open side to side, close, etc.). For example, if she chose number 6, open and close the Star Finder 6 times. Then, ask the person to look inside the Star Finder and pick one of the four visible constellations. This time, open and close the Star Finder once for each letter to spell out his choice. For example, if he chose "Lyra," you would open and close the Star Finder 4 times, once for each letter: L - Y - R - A. Ask the player again to pick one of the four constellations visible. Open the panel to see the name of a constellation (highlighted in red) she will try to find in the sky for this month. For some of the months, not every part of the Star Finder may show a highlighted constellation for you to find. In this case, just try to find the constellation that is nearest to the part of the sky you picked. Or, just find any constellation! A constellation is group of stars like a dot-to-dot puzzle. If you join the dots—stars, that is—and use lots of imagination, the picture would look like an object, animal, or person. For example, Orion is a group of stars that the Greeks thought looked like a giant hunter with a sword attached to his belt. Other than making a pattern in Earth's sky, these stars may not be related at all. For example, Alnitak, the star at the left side of Orion's belt, is 817 light years away. (A light year is the distance light travels in one Earth year, almost 6 trillion miles!) Alnilam, the star in the middle of the belt, is 1340 light years away. And Mintaka at the right side of the belt is 916 light years away. Yet they all appear from Earth to have the same brightness. Even the closest star is almost unimaginably far away. Because they are so far away, the shapes and positions of the constellations in Earth's sky change very, very slowly. During one human lifetime, they change hardly at all. So, since humans first noticed the night sky they have navigated by the stars. Sailors have steered their ships by the stars. Even the Apollo astronauts going to the Moon had to know how to navigate by the stars in case their navigation instruments failed. We see different views of the Universe from where we live as Earth makes its yearly trip around the solar system. That is why we have a different Star Finder for each month, as different constellations come into view. Also, as Earth rotates on its axis toward the east throughout the hours of the night, the whole sky seems to shift toward the west. The Star Finder charts are for a latitude of 34° N, which is about as far north of the equator as Los Angeles, California. (Charts are from The Griffith Observer magazine.) The farther north you are, the more the constellations will be shifted south from the Star Finder charts. The Star Finder charts show the sky at about 10 PM for the first of the month, 9 PM for the middle of the month, and 8 PM for the last of the month. These are local standard times. For months with Daylight Savings Time, star chart times are an hour later. The star charts are maps of the sky overhead. So, to get the directions lined up, hold the map over your head and look up at it, and turn it so the northern horizon side is facing north. If you live where big city lights drown out the beauty of the stars, you may see only a few of the brightest stars and planets. How sad! But see if you can find at least one or two constellations on a clear, Moonless night. Ever wondered about the difference between astrology and astronomy? What else are constellations good for? Star patterns are also very helpful for navigating a spacecraft. Most spacecraft have steered by the stars—or at least checked the stars once in a while to make sure the spacecraft was still on course and pointed in the right direction. Space Technology 6 is a mission to test a new, very small and energy-efficient kind of reference system. This new system is called an Inertial (in-ER-shul) Stellar Compass, or ISC. The ISC is made up of a star tracker and a gyroscope. Working together, they keep the spacecraft on course. The star tracker, like a camera, takes a picture of the star patterns in its view and compares the picture with its built-in star maps. This is how it can tell the spacecraft exactly which way it is pointed. In between pictures from the star tracker, the gyroscope tells the spacecraft how it is pointed. Together the star tracker and gyroscope keep the spacecraft stable and oriented in the right direction in space (for example, not flying "upside-down" or sideways). But the gyroscope can hold stable for only a short time. To keep the gyroscope perfectly accurate, information from the star tracker is sent to the gyroscope every few seconds. The thing that is new and different with the Space Technology 6 ISC is that the two devices are combined into one tiny, light-weight system that needs little power to run. 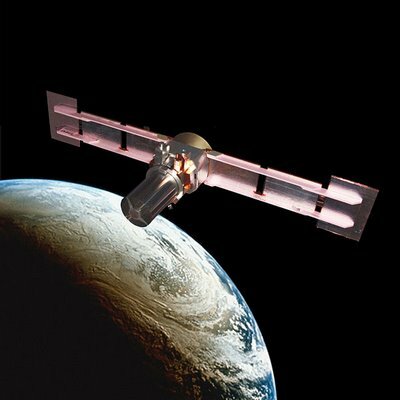 The ISC was tested on the U.S. Air Force TacSat-2 microsatellite, and it worked just fine. 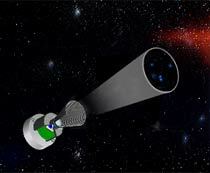 Now the ISC technology can be used on future spacecraft sent on missions of discovery.